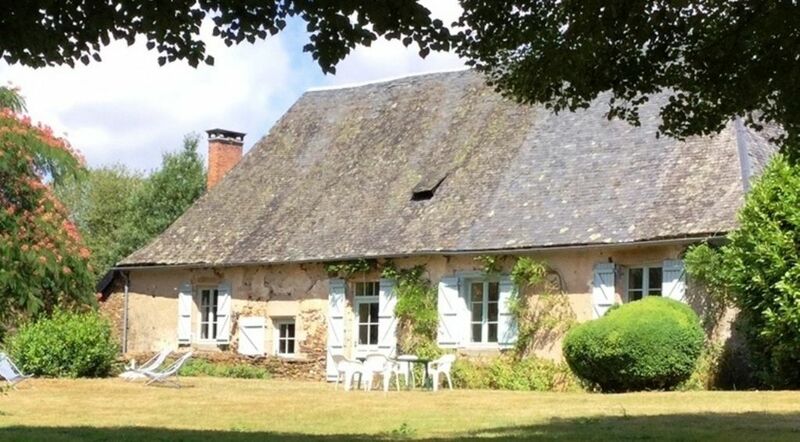 In a remarkable natural environment alternating vast hilly meadows and woods of oaks and chestnuts, the Gîte des Chaises Basses is a beautiful and old Corrèze house, entirely independent. All the house is on the ground floor, opening onto the vast enclosed garden of 2000m2. Access by a dead-end road. Absolute calm. Really in the countryside. No vis-à-vis. At night, away from any light pollution, the starry skies are spectacular! The Gîte des Chaises Basses is very well equipped for the comfort of 6 people. A traditional farmhouse dating from the 1780s. It has been very nicely restored in the past. The house is equipped with modern facilities which work well. There is a fully functioning kitchen including dishwasher. The bathroom and toilet fittings are reasonably modern and the walk in shower works well There was ample hot water. The only omission was a dryer for the washing. Unfortunately we had some wet weather and it was difficult to dry clothes inside with only a folding rack. The wooden floors are original ,somewhat undulating and creak a bit,but this is rather natural for such an old building which has been sympathetically restored. Ther are electric wall heaters which mainly work and for cold weather one can have a log fire in the huge original fireplace. Mobile telephone reception was rather marginal. There is Internet connection which worked reasonably but not in all rooms. There is good car parking at the side of the house. A large lawn can be enjoyed in good weather behind the house. A working farm goes on nearbye and sight and sound of the cows is pleasant. The young farmer just up the lane is very friendly and speaks English. The location is very rural in pretty undulating countryside with lots of small villages in the area. Objat and Vigeois are the local towns about 15 or 20 mins away. Further away there is very pleasant upland country areas and the Dordogne valley is very attractive. Brive La Gaillarde is a city which has been well restored but otherwise not so remarkable. A stay at Les Chaises Basses would appeal to visitors seeking traditional rural France without a heavy tourist presence. This Is a typical 18th century country house - it's very quiet. The owner lives down the road and is very helpful. Everything needed is provided. There are some pretty villages in the area. The closest shopping and restaurants are at least 15 min. away, so it's remote, but very charming. Nous avons été très bien accueillis par Monsieur De Lupel. Merci beaucoup de votre appréciation élogieuse sur la maison et son jardin. Effectivement de nos jours et de plus en plus c'est un privilège d'avoir de l'espace et un calme parfait. C'était pour moi un plaisir de vous accueillir. J'apprécie vivement votre enthousiasme sur votre séjour effectué avec votre petit garçon et votre labrador, notamment sur le bel environnement naturel, le calme et le charme de la maison. Merci aussi de mentionner que le gîte vous est apparu mieux que sur les photos ! Certainement il faut que j'améliore mes photos publiées sur internet.. Peut être à une autre année. Il y a tant de belles choses à découvrir dans les environs. The amazing, cosy old house, is perfectly equiped, comfortable furnished and the nature and country around is simply a dream!!! The owners are very friendly, kind and helpful people,so everybody can enjoy the stay in this magic piece of French countryside, and visit a lot of interesting cultural and historical places nearby. Apporter draps et linge de toilette. En option sur demande : location de draps 10€ par paire, serviettes de toilette 5€ par personne, ménage en fin de séjour 60€, Bois pour la cheminée sur la base de 60€ le stère, soit environ 5€ la flambée Chauffage à l'électricité : forfait de 8kWh inclus dans le prix de la location et ensuite 0,15€ par kWh supplémentaire. Le ménage est effectué par le locataire. En option sur demande : forfait 60€ pour le ménage en fin de séjour.